We've had six great weeks playing Crota's End and now Hard Mode is on the horizon. Those that have made it to Level 32 will get their chance to earn the prized assets from the Dark Below DLC in the shape of Raid Primary Weapons. In this post I'm going to discuss all the Raid primary weapons, in addition to gameplay videos showing every gun in action. All we've been hearing lately is Necrochasm, Necrochasm, Necrochasm. But truth be told, the Necrochasm is just one of a number of exclusive Raid weapons. It may have a unique (and fun) upgrade path from a simple Common weapon through to Legendary and Exotic, but it's extremely low impact bears a worrying resemblance to Atheons Epilogue. Secondly, think back to the Vault of Glass. We all loved the Vex Mythoclast but then everyone wanted Fatebringer for the next Raid. Why? Because Hand Cannons still rule when it comes to PvE and it's likely that the Crota's End Hand Cannon will be the best too. If you'd like to read more about the Necrochasm see this post for information on acquiring the weapon and also gameplay videos. Before I discuss the weapons, let's take a brief moment to look at the Hive Disruptor perk. In the same way that all Vault of Glass primaries had the Oracle Disruptor perk, all the Raid primary weapons from Crota's End have the Hive Disruptor perk. This is the 6th upgrade slot for all Raid weapons and the perk grants more damage to Hive majors. This perk gives raid weapons a distinct advantage for Hive strikes and repeated CE raids. In particular, repeated Hard Mode runs will be easier for players who have Raid weapons with this perk unlocked simply because enemies are Level 33 throughout. Note: this image will be updated once hard mode is released. A Raid exclusive Auto Rifle with Solar Burn damage. This weapon will be high on the agenda simply for the fact that it's an Auto Rifle but look closely at the stats and you'll see a dismal impact rating with an incredibly high rate of fire. Compared to Atheons Epilogue (which also has a low impact, high fire rate) the Abyss Defiant has a slightly slower fire rate but a quadrupled impact rating - that's good news. The value jumps from 2 to 8 in this department whereas the magazine size is only halved when comparted to AE. This means that the Abyss Defiant will feel like a better reward than the AE did. When placed up against other regular Vanguard Auto Rifles the Abyss Defiant is still a worthy choice, matching others such as "Up for Anything" in the impact rating. But when compared to the ultimate Auto Rifle i.e. Suros Regime, all of these Auto Rifles fall well short of the mark. Projectiles have a chance to disorient Hive wizards. 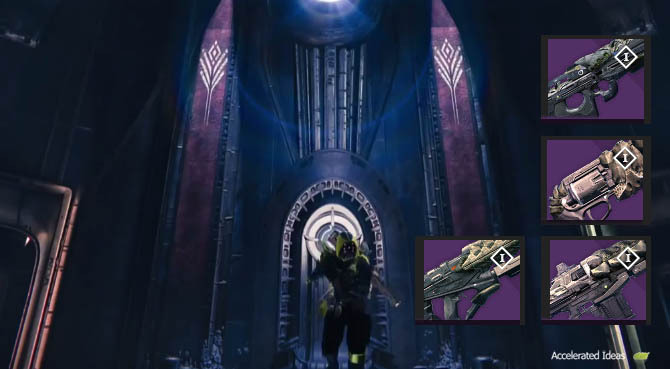 Of all the ads in Destiny the wizards are probably the most annoying, thus making this weapon great for the Summoning Crystal stage of the Raid as well as Omnigul and the wave section of the Summoning Pits strike. Even with its low impact rating, your Raid/Strike team will certainly appreciate a disoriented wizard to speed things up. 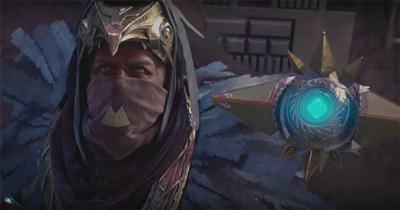 If you asked me "which weapon are you looking forward to the most" it would have to be the Word of Crota. This thing looks awesome for a start and being a Hand Cannon it's a high impact killing machine. Compared to Fatebringer, the Word of Crota is similar in most departments. It has a slight 17% reduction to Impact but a 50% increase in reload speed. Both Hand Cannons have exactly the same magazine size. Fatebringer is eternally limited to Attack 300 now, meaning that moving to Word of Crota is inevitable but with these stats you're not going to be disappointed. Causing damage with this weapon increases its stability. So hit more targets and the weapon becomes easier to handle, thus making it easier to get precision kills. Rapidly landing three precision hits returns one round to the magazine. Similar in some ways to Black Hammer, in that accuracy is rewarded with free ammo but don't mistake this for an entire magazine - it's just one round. If you do the math for this perk - perfect precision will give you a total of 17 shots rather than 12 (the standard magazine size) before a reload is required. The only downside to this weapon is its damage type which is Void. It's going to be more useful against Shielded Vex (Minotaurs) than Fallen or Hive enemies. The first upgrade perk is that of Full Auto allowing you to simply hold down the trigger and let the bursts do their stuff. The high rate of fire turns the weapon into a near Auto Rifle equivalent. But even Full Auto can't fix the core problem with Pulse Rifles and that's time to kill. Whilst this weapon is better than most once Full Auto is unlocked, the impact rating is still very low. So what makes this weapon any good? Oversoul Edict's high level upgrade is called Dark Breaker which allows projectiles to over penetrate through the Knights Wall of Darkness. Combined with Arc damage, the over penetration will really help against shielded knights on the Omnigul strike and possibly the new Captains in the House of Wolves DLC. The 3rd Eye perk keeps the radar active while aiming down sights. Those of you who own the Mida Multi-Tool will be well-versed with this upgrade already. Compared to the Vision of Confluence (which was the VoG Scout Rifle) this weapon has similar values for most stats such as Fire Rate, Impact and Reload Speed. The real difference lies in the Range with The Fang of Ir Yut having a significantly longer range. The "always on" radar serves well in PvP but isn't as useful in PvE encounters simply because enemies appear in greater numbers and are less likely to creep up on you. That said, any Arc damage primary weapon will come in handy for the House of Wolves simply because of the shielded Captains.